On September 15th Microsoft has released Exchange Server 2010 Service Pack 3 Update Rollup 11 (SP3 RU11). Rollup Update 11 contains the latest set of fixes. Exchange Server 2010 Service Pack 3 Update Rollup 11, is the minimum version of Exchange Server 2010 which will be supported in a coexistence deployment with Exchange Server 2016. Microsoft announced yesterday that release Exchange Server 2010 Service Pack 3 Update Rollup 11 is the minimum version of Exchange Server 2010 which will be supported in a coexistence deployment with Exchange Server 2016. Update RU11 for SP3 (SP3 RU11) can be downloaded from Microsoft. 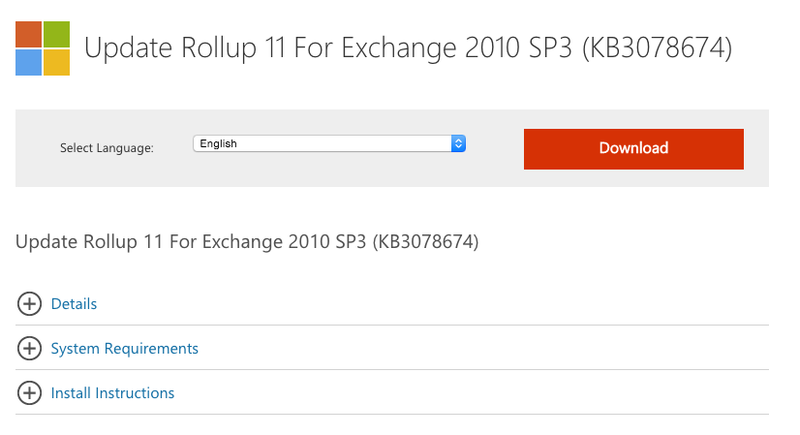 Update Rollup 11 for Microsoft Exchange Server 2010 Service Pack 3 (SP3) was released on September 15, 2015. Before you install this update, you must remove all interim updates for Exchange Server 2010 SP3. Please check important information about how to install this update on Microsoft webpage before applying the update.